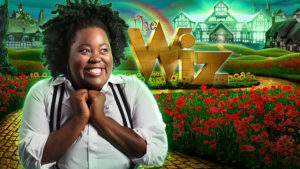 We got away for my birthday weekend to go up to Ashland, OR, and a visit to the Oregon Shakespeare Festival, which is presenting The Wiz this summer at the Allen Elizabethan Theatre. This first fully staged version of the show I’ve seen. Back in 2009, we saw a City Center concert presentation of the show. Of course, we saw NBC’s spectacular live broadcast in December 2015, and the movie version is in our Blu-Ray collection. OSF’s staging was outstanding in every way and made even more magical by its use of the outdoor Elizabethan theatre. Director Robert O’Hara embraced the setting and made Oz Elizabethan, which connects back to Dorothy living in modern day Kansas studying Shakespeare in her high school English class. Byron Easley’s choreography was great. The Tornado Ballet is always a favorite and the storm clouds moving Dorothy around the stage was a clever way to show the transition to Oz. The moving yellow brick road during “Ease on Down the Road” was fun. In particular I loved the citizens of Oz in the Emerald City Ballet, which was reminiscent (at least to me) of Madonna’s “Vogue” performance from the MTV Video Music Awards. Beyond the show, I enjoyed Ashland. The downtown areas was full of cute shops, including several bookstores, and galleries. The food was excellent–among the best meals were breakfast at Morning Glory cafe and a scrumptious Italian pre-show dinner at Pie + Vine. I look forward to a return trip to Ashland in the future to explore some more.